Great. Love the drum and bass production. B.o.B is a great addition. Not as good as Saved In A Bottle yet but I can see it getting there. I really hope this becomes a hit when it's released in a few more weeks.<br><br>EDIT: Eh it hasn't aged well for me already and I don't like it *that* much anymore. It's still enjoyable but I regret giving it such a good chart run on my chart. "Saved In A Bottle" is much better. Much better than 'Saved In A Bottle'. 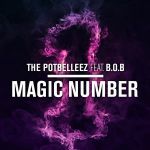 A great direction for The Potbelleez to pursue (I really like DnB :P), and good inclusion of B.o.B. Seems like an odd pairing to me. Didn't mind it, but they've both had much better. Average Dance track, their earlier stuff was better hence why this hasn't charted. Quite sad that this didn't make the Top 50. Surprised this hasn't even taken off yet, catchy track. Cool. B.o.B is alright in this.